Neon Wolves’ Jaydon Antoine lands on the sandpit during the boys Under-20 long jump yesterday. AYLA Stanisclaus of RSS Phoenix secured the qualifying standard for this year's Carifta Games, winning the Under-20 girls 200-metre final in 23.92 seconds, at the close of the two-day National Association of Athletics Administrations (NAAA) Carifta trials, at the Hasely Crawford Stadium, Mucurapo yesterday. Stanisclaus, dipping under the Carifta standard by 0.08 seconds, defeated Akilah Lewis (24.36) in a replay of the 100m final the previous day. Unlike on Saturday, Lewis' runner-up finish was not fast enough to see her secure a Carifta standard. Stanisclaus secured a NACAC Under-23, Pan American Juniors (both 11.60 seconds) and Carifta standard (11.71 seconds), by winning the Girls Under-20 100m final in 11.58 seconds. Cougars' Shaniqua Bascombe, in the Under-17 division, won the 200m final in 24.36 seconds, well below the NACAC Under-18 standard of 24.90 seconds, while Taeja Badal, who finished runner-up in both the prelims and final, secured the Carifta standard in her first effort of 24.67 seconds. Also in the Girls U-17 division, three athletes secured Carifta standards of 32m in the 1kg discus throw. Tobago Falcons' Shakera Kirk won with a mammoth 35.93m effort, while Lalenii Grant of Mercury (33.75m) and Brianna Percy, also of Tobago Falcons (33.56m), placed second and third respectively. Meanwhile, unattached athlete Tamia Badal won the Girls Under-20 400m hurdles and secured a Carifta qualifying time (1:01.50). Yesterday, however, the majority of Carifta qualifying standards were achieved by field athletes. 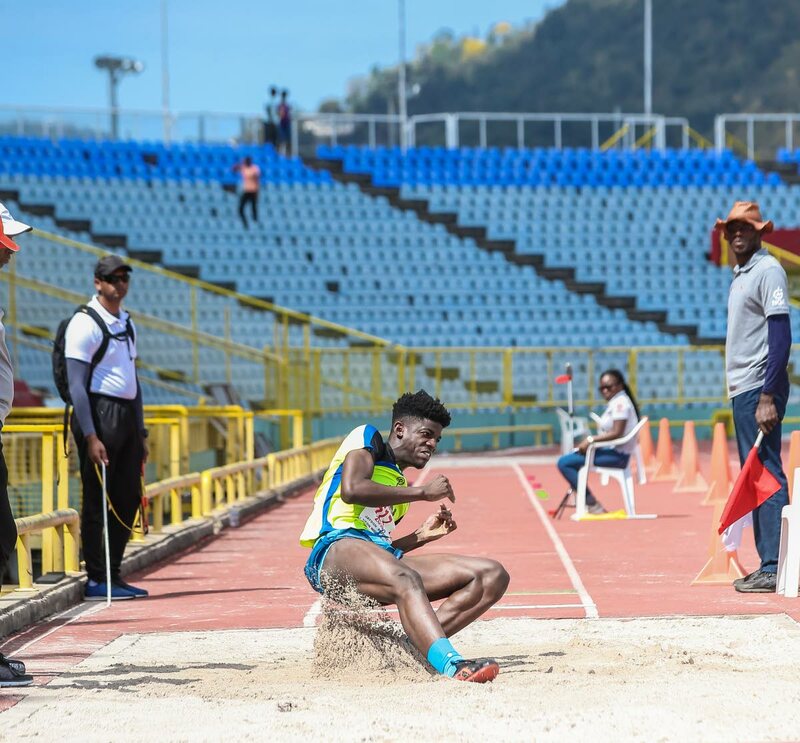 In the Boys Under-20 long jump, Kelsey Daniel (7.50m) and Jaydon Antoine (7.33m) placed first and second respectively, with efforts which would qualify them for both the Carifta Games (7.26m standard) and Pan American Juniors (7.30m standard). Joel Andrews, the lone athlete in the Boys Under-20 pole vault, achieved a Carifta Games qualifying standard (3.45m) after clearing a 3.70m effort. Mercury's Jayden Scott, in the Boys Under-17 1.5kg discus throw, threw a winning effort of 44.35m to score well ahead of the 41m Carifta standard. Striders' Israel McNish, the runner-up, was just shy of the standard, marking 40.35m. Among the other athletes, who earned Carifta qualifying standards on Sunday were Joseph Veayon (Boys U-17 javelin), Rinaldo Moore (Boys U-17 400m hurdles), Rinaldo Moore (Boys U-17 400m hurdles), Antonia Sealy (Open heptathlon), Tamia Badal (Girls U-20 400m hurdles) and Ianna Roach (Girls U-20 shot put). Long Jump: 1st – Daniel Kelsey, Kaizen Panthers, 7.50m; 2nd – Jaydon Antoine, Neon Wolves, 7.33m; 3rd – Savion Joseph, Zenith, 6.86m. Pole Vault: 1st – Joel Andrews, D'Abadie, 3.70m. Javelin: 1st – Joseph Veayon, Tobago Select, 53.22m; 2nd – Anthony Diaz, Point Fortin New Jets, 47.98m; 3rd – Mickelle Edwards, Zenith, 42.35m. Discus Throw: 1st – Jayden Scott, Mercury, 44.35m; 2nd – Israel McNish, Striders, 40.35m; 3rd – Jaden James, Fatima, 38.30m. 400m hurdles: 1st – Rinaldo Moore, Memphis Pioneers, 56.11; 2nd – Brian Morris, Cougars, 58.19; 3rd – Shakeer Mohammed, EFA, 1:05.17. Heptathlon: 1st – Antonia Sealy, Fulfilling Athletics, 4,648 pts; 2nd – Melissa Boxhill, Cougars, 2,876. 100m final: 1st – Ayla Stanisclaus, RSS Phoenix, 23.92; 2nd – Akilah Lewis, Concorde, 24.36; 3rd – Leah Bertrand, Simplex, 24.57. 400m hurdles: 1st – Tamia Badal, Unattached, 1:00.40; 2nd – Odeshia Nanton, St Vincent, 1:03.95; 3rd – Patrice Richards, Neon Wolves, 1:04.50. Shot put: 1st – Ianna Roach, Memphis Pioneers, 13.59m; 2nd – Elizabeth Galera, Burnley, 11.04m; 3rd – Shantel Licorish, Striders, 10.82m. Discus Throw: 1st – Shakera Kirk, Tobago Falcons, 35.93m; 2nd – Lalenii Grant, Mercury, 33.75m; 3rd – Brianna Percy, Tobago Falcons, 33.56m. 200m finals: 1st – Shaniqua Bascombe, Cougars, 24.36; 2nd – Taejha Badal, Unattached, 24.91; 3rd – Malika Coutain, Point Fortin New Jets. Reply to "Field athletes take spotlight at Carifta qualifiers"